Protective Bumpers BS-01-SD Clear Soft 200/Sheet 5000/Box 12.7mm x 3.5mm - Micro Parts &amp; Supplies, Inc. 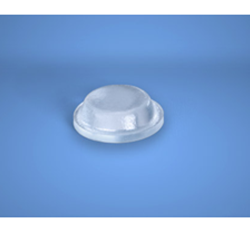 Description The Soft Durometer (SD) Bumpers have been specifically engineered to provide the quietest closure available for any cabinet door, drawer, or enclosure. The Soft Durometer Bumpers use a device called “FlexibleSoftness” which absorbs the physical force of any impact by more than half. A very soft polyurethane material and varying unique designs are employed to achieve this impressive result. The Soft Durometer Bumpers were not designed for load bearing applications. The Soft Durometer line is made exclusively out of Clear material.